Before you all say 'I've seen this reviewed before', you have, but because it came bundled in the new Amiga Magic Pack it only got a miniature-esque review squeezed into the main pack evaluation. Now, however , it's available as a standalone product and therefore deserves a review all to itself. And here it is. As you've probably gathered, it's the latest pinball sim from 21st Century, the publishers renowned among pinball wizards for releasing some of the best sims around. However, there's one big difference this time and one that has left me with my doubts about this title. The developers of the previous games were Digital Illusions, and the games were then converted to the PC by Spidersoft. Now, however, Digital Illusions have been left out of the qauation altogether and development left in the hands of Spidersoft. It's a big mistake and all too obvious that Pinball Mania is not up to the same standards as Pinball Illusions, Pinball Fantasies, or Pinball Dreams. The game provides you with four tables (one more than Illusions, admittedly - but it's quality not quantity that counts) and each has a different them, with various missions related to them. One table, for example, has a football-style topic and provides missions such as spelling Kick Off to start the penalty shoot-out mode, or shooting the ball trap to reach the next round of the league. Jailbreak, the most atmospheric of the tables, uses a sinister theme with an evil judge overseeing the proceedings. You can start a riot, sentence a suspect, or spell Law to advance to the bonus multiplier value. Although the themes have been well thought out, the graphics do nothing to create realism and are far from impressive. The game is AGA only, although you wonder why when you actually see and compare it to Pinball Illusions - it looks decidedly poor and out of date. All this could have been forgiven if the playability was up to scratch unfortunately, though, it's not and fails to keep the player interested. There's no elusive 'addiction' ingredient that should be there to keep you returning for just one more go. Realism should also be an essential factor in a game such as this, but again this was absent. The flippers felt sluggish and even at full power, the ball minced around the table like a snail on dope. The sound worked quite nicely though with an appropriate tune for each table, and sound effects gave it some atmosphere. See? It does have its redeeming features but the poor gameplay factor still remains. The problem seems to be that we're all still spellbound by 21st Century last pinballer, and this just seems like a step backwards rather than continuing the trend of quality by improving it with each release. It does play okay for a while and there are a few nice touches such as a fruit machine on the Jackpot table, but it's not the sort of game you'll want to play for hours on end. Disappointing to say the least. A game that's bundled with the new Amiga Magic packs, Steve McGill tests the flipper movement and puts the ball action to the test. But will he be coming back for more? Probably one of the best things about pinball games on the Amiga is the fact that you don't have to play them in a smoky pub full of noise and interfering punters eager to ridicule you for any inadequacies in your play or playing style. Also, pinball games don't cost a hefty quid for three measly credits; they let the player practice as much as required without resorting to mockery; they can be trusted not to have the tilt level set too high; and they offer a choice of different tables without having to physically move location. But, in order to work, they must have a believable ball action; they must have flippers that work properly and act accordingly; they must have enjoyable sub-games; they must entertain; and they must bring the player back for more. So, Pinball Mania then. What are we to think of it? It is after all the fourth in a series of, up till now, increasingly enjoyable pinball games from 21st Century Entertainment. The first three: Pinball Dreams, Fantasies and Illusions were coded by Digital Illusions. The first two of those worked with A500s and A600s. Illusions, however, was AGA only because for the first time, it offered multi-ball - a feature that required use of a hi-res mode so that all the balls could be seen at the same time on the table. Pinball Mania, surprisingly, is AGA-only as well. Strange, considering that it doesn't look as good as Illusions, doesn't offer a Hi-Res mode, yet offers a hobbled version of the multi-ball feature. In this instance, though, whichever ball is the lowest is the one the game follows. This basically means that use of the upper flippers in most cases is redundant due to not wanting to lose any balls - there's no point, after all, in being able to operate upper flippers when the bottom ones are needed to defend the loss of a ball. Unfortunately, it does make a mockery of having a multi-ball feature in the first place. You have to ask yourself, what's the point when, as soon as you hit a ball above another, it might as well have been hit into cyberspace? What is the point of an AGA-only game, when it doesn't make full use of the AGA chipset? Indeed, what is the point of having the game as an AGA-only product, when it doesn't make use of the AGA chipset goodies at its disposal? It certainly doesn't show the potential of the AGA chipset, say, the way that Pinball Illusions, Fears, Gloom or Alien Breed 3D do. In fact, all it does really show is that 21st Century should have contracted Digital Illusions rather than Spidersoft to code Pinball Mania. Instead, they've relied on the coding abilities of the latter team who, quite honestly, made a hash of the conversion of Pinball Dreams and Pinball Fantasies on to the SNES. Not that Pinball Mania is hashed up, mind you. It's just that it doesn't make it into the same league as Pinball Illusions. When all is considered, it's a retrograde step that offers nothing new. Especially when compared to so many other games out there displaying, in all their glory, just what an A1200 is capable of - even in its present power shackled 68020 2Mb minimum form. So, we've reached this far and I still haven't told you a great deal about the actual tables, other than complained about the inadequacy of the multi-ball feature. Well, unlike Illusions, it's back to the old 21st Century formula of four tables. This time round they are: Tarantula, Jailbreak, Kick Off and Jackpot; each one sporting its own particular peccadilloes and character. Check them out in the little boxes, provided courtesy of the Format aft people, dotted around these pages. The biggest problem with Mania concerns both the strength of the flippers and the mechanics of the ball. One, if not both, are fundamentally wrong. They feel wrong. They play wrong. They're wrong full stop. Combined, they suspend the belief that pure skill alone will see the player's score appear consistently on the high score table. Too many of the skill shots rely on luck to try put them into the rank of skill shot. That's damning for a pinball with the pedigree of its predecessors behind it. If I were a cynic, I'd suggest that 21st Century have lost interest in the Amiga market and have decided to avoid the extra expense of intensive game testing. But I'm no cynic, so I've got absolutely no explanation as to why this has been included in the bundle. Other than the strength of the brand name and the fact that there is a modicum of entertainment value well hidden away, it beggars belief that this has been chose as a flagship game over the top of superior AGA-only games. Nice one, Amiga Technologies. Possibly the least enjoyable of the tables. If you pull the plunger all the way back, fire it off and don't nudge the table, the ball will find its way straight down the exit lane. An intriguing table characterised by some very annoying features. Play Hi-Lo for big bonuses. Play roulette. Spin the reels and collect on big bonuses. Mildly entertaining. Vies with Kick Off as most engaging table. Capture prisoners. Judge them. Sentence them. Stop them from escaping and quell any riots and jailbreaks that occur. My favourite table. Build a team, try and gain some subs. Kick Off. Score goals. Make your way to the cup final. Avoid the offside trap and go for the penalty shoot-out. Does not show the AGA chipset at its best. Competent. Nothing showy, flash, or tricksy. Can take it or leave it. Not compulsive. The ball and flippers aren't believable. Nothing flash. Nothing innovative. It's all been seen before, only better. Ein Einstand nach Maß: Ihr Erstlingswerk ist der Crew von Spidersoft so gut gelungen, daß man sich bei Escom entschlossen hat, es jedem neuen 1200er beizulegen - aber auch AGA-Veteranen können bei dieser traumhaften Flippersimulation schwach werden! Blutige Anfänger sind die englischen Programmiererspinnen allerdings nicht mehr, denn sie haben im Auftrag von 21st Century ja schon diverse Werke ihrer schwedischen Kollegen von Digital Illusions ("Pinball Dreams", "Pinball Fantasies" und "Pinball Illusions") auf den PC umgekehrten Richtung; zudem um eine so stark verbesserte, daß man schon fast von einem zweiten Original sprechen kann: Die Tische und auch die Animationen der Spielstandanzeige sehen schöner aus als anno DOSe, dazu hat die Grafik am Scoreboard das Scrollen gelernt. Vor allem aber ist das Ballverhalten ein ganzes Stück realistischer geworden, weil man der Amigaversion komplett neue Programmroutinen spendiert hat. Der Preis für die ganze Pracht heißt AGA only, denn eine ECS-Variante ist selbst auf längere Sicht nicht wahrscheinlich. 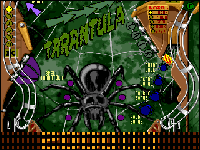 Insgesamt vier Flipper gehören zum Lieferumfang, und die schauen wir uns mal der Reihe nach an: "Tarantula" ist ein spielbares bzw. Berollbares B-Movie mit kreischenden Frauen und weiteren schrillen Geräuscheffekten, die genau wie die Begleitmusik von Altmeister Martin Walker stammen. Wer sich im Netz der Spinnen verfängt, findet am Tableau vier Paddles vor; neben den beiden obligatorischen am unteren Ausgang noch eines in der Mitte, mit dem man die Kugel auf die rechte Rampe befördern kann. Von dort aus erreicht man über eine "Giftzahn"-Röhre eine Erhöhung, die Spinnenbein Nummer vier enthält. Diese Stelle ist deshalb so interessant, weil sich dort auch die Multiball-Funktion aktivieren läßt - übrigens jetzt leichter als anno PC. Trotzdem dürfte man zunächst mit der einfacher erreichbaren "Spinnenhöhle" mehr Punkteglück haben, dazu lassen sich natürlich auch zahllose Bumper, Propeller, Leuchtbuchstaben etc. anschießen. Keinen Deut schlechter, nur ganz anders, ist "Jailbreak", der Ausbruchkönig unter den Flippern. Hier hört man knackigen Hardrock im Hintergrund, dazu Sirenengeheul, Alarm-Gebimmel und Baller-FX. Paddles sind ebenfalls vierfach vertreten, allerdings diesmal paarweise angeordnet - und das obere Pärchen wird seitenverkehrt bedient, die linke Shifttaste löst also das rechte Paddle aus und umgekehrt. Ansonsten gibt es eine "Sicherheitsrampe", die "Aufstand"-Kugelfalle, einen "Fluchttunnel" und die Entscheidung "Schuldig" oder "Nicht shculdig", die selbstverständlich mit der Kugel getroffen wird. Wie bei allen übrigen Tischen auch kommt dazu noch ein besonders schwierig auszuführender "Skillshot", der die Punkte gleich millionenfach herabregnen läßt. Die meisten Punkte wurden in unserer sportlich gestählten Redaktion aber bei "Kick Off" erreicht, wo nicht nur das lebensnahe Publikumsgegröle und -geschunkel für die richtige Fußballstimmung sorgt. Man kann hier auch das Stadion ausbauen, Tore schießen, Ersatzspieler einwechseln, Fouls begehen, unter Zeitdruck zum Elfmeterschießen antreten oder Pokale gewinnen. Selbst wer mit der Bolzerei nicht so viel am Hut hat, wird sich über die zwei länge schön geschwungenen Rampen freuen, die direkt im Visier des zweiten Paddle-Paares liegen. Darüber hinaus läßt sich mit einer zweiten Abschußeinrichtung ein zusätzlicher Ball ins Spiel bringen - das ist zwar ein klarer Verstoß gegen die FIFA-Regeln, macht aber trotzdem einen Höllenspaß! Fehlt noch "Jackpot", ein Tableau, das erst dann etwas mit Glück zu tun hat, wenn der Spieler zuvor sein Geschick im Umgang mit der Silberkugel ausreichend bewiesen hat - möglicherweise hilt auch die "Hufeisen-Rampe" Fortuna etwas nach. Aber im Fall des Falles darf man tatsächlich fette Gewinne einstreichen, nämlich am "Roulettetisch", vor dem "Einarmigen Banditen" oder beim "Kartenspiel". Und damit auch wirklich Kasino-Atmosphäre aufkommt, plätschert Barmusik aus den Boxen, während sich der fremdsprachige Croupier im berufstypisch gedämpften Tonfall bemerkbar macht. Alle Tische erlauben gleichermaßen die Teilnahme von bis zu acht Spielern, die drei oder fünf Bälle rollen lassen dürfen. Die Highscores werden gespeichert, man kann die Tastaturbelegung und de Neigungswinkel der Ebenen seinen Wünschen anpassen, ja sogar eine SW-Option für die in England angeblich noch recht verbreiteten Uralt-Fernseher ist vorhanden. Die Musik ist ebenfalls abstellbar, aber dazu besteht absolut keine Veranlassung! Auch die Grafik sieht recht ordentlich aus, selbst wenn sie nicht an die optische Klasse von Pinball Illusions heranreicht. Rundum gelungen ist dagegen das Gameplay, denn in Sachen Spielwitz macht den Spidersoft-Tables so schnell kein anderer Flipper etwas vor. Um so dringlicher erscheint es uns, daß Amiga Technologies jetzt nicht länger zögert und dieses tolle Game wie angekündigt noch vor Weihnachten für den regulären Verkauf freigibt. "The elated phase of manic-depressive psychosis," apparently. How piteously inapt. Paul who was obliged to go a computer show recently, tells us that the Amiga Technologies stand was directly opposite the Playstation one. As he arrived, the Playstation stand sprang into action. "PREPARE FOR... THE PLAYSTATION!" bellowed outrageously large speakers. Gigantic television screens showed scenes from a super-fast first-person racing game with stomach-churning vertical drops. The Chemical Brothers and Orbital, two of today's most popular modern beat combos, started blasting passers-by with their individual brand of music. Flaags inscribed 'Only £300!!!' unfurled from the ceiling. If Pinball Mania was wanted by the local police - say after defrauding the council but fortunately being taped walking around town by one of carefully co-ordinated battery of closed-circuit cameras - this is how the wanted post would look. There would be a 'computer-enhanced' mugshot blown up from the tapes, its name and known aliases, and this description of its 'distinguishing features': "Shoddy programming; simple playfields; inaccurate ball handling; scar on left knee." The description would continue, "A console pinball game - but on the Amiga," and the poster would conclude with stern warnings to alert a constable should the game be spotted. The poorness of Pinball Mania defies rational explanation. It's the lead game in the new Amiga bundle, it's from 21st Century (they who published Pinballs Dreams, Fantasies and Illusions) and it's A1200-only. It manages to sweep aside all these obvious advantages to clamber awkwardly upon your lap and paw you like a jammy child. Its four tables suffer a poverty of features. The spectacular tricks and glitzy animations of Pinball Illusions have been jettisoned. It looks and sounds nowhere near as god as the A500-compatible Obsession. Almost impossibly, its movement routines are wrong: the ball moves badly, speeding up at random and always taking route X if you hit point Y. You can calter the angle of the table between steep, average and shallow - in steep mode the ball sticks permanently to the flippers, while in shallow mode the ball 'floats' as if you were playing in slow motion. The game is bugged. The programmers of Pinball Mania are not the same people as the programmers of Pinballs Dreams, Fantasies and Illusions. They are, in fact the people who converted those games to the consoles, and with Pinball Mania they have appeared to try putting a console pinball game on a computer without, for example, exploiting the computer. (I can't possibly believe that the programmers sat down and looked at Pinball Illusions and then deliberately set out to ignore it completely. Playing them side by side, it looks as if Pinball Mania preceded the other by at least 68 years). In time-honoured fashion, the boxes about these pages describe the individual tables. All, however, suffer the same limpness of design. There's no attempt at 'computer' pinball (astute readers will recall the phenomenal 'curvy bowling' of Obsession's baseball table) and as a sim of the real thing it's dreadfully 'off'. The ball is abominably heavy and unresponsive - whacking it full with a flipper barely tickles it, and trying to get it consistently to go where you want is ridiculously difficult. And the multiball - lordy, the multiball. Two balls, no hi-res mode (so you haven't a clue where the higher ball is), exactly the same things to do as before, no sense of urgency or thrills - truly, it's the one-ball game but with another ball. I'd originally planned a sort of three-rating final paragraph for Pinball Mania: how it stood up on its own, and how it compared with its two best rivals. Having played the game above and beyond the call of duty, I now feel this would be unnecessarily cruel. For example, I would have to say that to release Pinball Mania in the same series a sPinball Illusions, as its sequel, is an act on 21st Century's part of if not criminal arrogance, then gross stupendity. I'd then have to wonder if the game was in fact finished, with its bugs and general awfulness (it is; we got our copy directly from Amiga Technologies, who broke open an A1200 bundle. We have, in fact, to send the game back after the review so they can replace it and sell the bundle). I'd undoubtedly be obliged to point out that Pinball Mania is shockingly brutally worse than the older, non-A1200, direct-ST-Port Obsession, which charmed me with its playability and sense of fun. I have, therefore, changed my mind, and will close by comparing Pinball Mania with the grunge Indie-pop played almost continuously in the AP office of late. I congratulate the game on being substantially less angering than this. Well done. THE PLOT: Battle a giant tarantula, apparently. Except it's clearly a black widow. THE TABLE: A spell-out table - spell 'terror' to open a new ramp so you can now spell 'fang' to win the right so spell 'poison'. What an incentive. 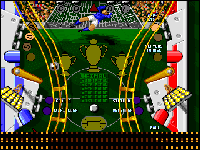 The playfield's excitingly full, but the angles at the top of the tables are horribly obligue and you can whang the ball around for ages without getting that final target. A great 'Feed Me!' bonus where a spider jumps on an innocent ant serves to shows up the blandness of the rest of it. (The spider in the middle, for example - it doesn't do anything. Even going "Roooaarghh!" occasionally would have helped.) Stunningly dull. THE PLOT: Win at a casino. These aren't very good plot, are they, readers? THE TABLE: An uncluttered table where (at last) some thought's gone into tying it all together. Jackpot has a good half-dozen big things to do, and (once again, at last) you can easily see what's happening and so plan your shot. The pleasing roulette wheel where you shoot one direction to change your colour and shoot the other to play is exceedingly rewarding, and the enjoyably busy upper half with its hugely silly high-low game is rapidly reachable. Even hitting the targets is a matter of skill. The only table of which you fee in control, and consequently the good one. THE PLOT: You are the law. Arrest and sentence people. And quash riots. THE TABLE: Wretchedly no-fun ramp-led crime-related table with clever ideas (reversed flippers in the middle of the table, 'guilty' and 'not guilty' targets after you've 'arrested' someone) that don't come off (the reversal is intrusive rather than fun, and the all-important verdict targets AREN'T VISIBALE FROM THE FLIPPERS). If you can't be bothered aiming for the many cursedly awkward drop targets, a high shot will cause the ball to roll down against one of the walls, hitting all the targets on the way. And there's a bit wher eyou shoot into a trap for a big bonus, the ball whizzes out of the other side, doesn;t quite make the bend and falls back for another bonus. Chinggg! THE PLOT: Win some football matches. THE TABLE: A coherent 'story' helps this one: shoot targets to select your team, trap the ball to start the match, spell 'goal' and pull off a worthwhile tricky shot to score. And I do like playing it in black-and-white for that authentic Schoolboy Spoilsport feel. (You can switch between colour and mono on all the tables. For some reason.) But - oh no! - it suffers from the same pathetic lack of excitement as the first two. Once again the angles are badly-designed, so it's largely a matter of luck whether you get the ball up to the vital higher flippers. The feed ramps speed the ball up for absolutely no reason at all except to catch you out. (Cheers.) And eight times out of ten you'll launch the ball and it'll go straight down the middle. Unbelievable. UPPERS A choice of three or five balls. You can still bounce a sidelanded ball off the centre pin and hence back into play. The pause screen has an option to restart the table. I not once lost track of the ball against the backgrounds. Get yet new A1200 and it's free. It's hard-drive installable. DOWNERS It's simple - not like, say, Obsession with a complementary 'style', but in the sense they've not bothered. It's feeble. It's bugged. ("Aaaaw," moaned the virtual me when he lost a roulette. "Aaaaw," he moaned when he won $5m. If you play with the sound effects, the last note of a sting - say, when you get a bonus - plays forever. The ball sticks to the table, and, once, lodged halfway through a flipper. Which later disappeared). The physics and ball movement are terrible. (You can switch to a steep or shallow table, but they're ludicrously unplayable). Only one of the tables is remotely playable, but all are pathetically unexciting. Few (and inept) 'LED animations'. Excruciating sound. It is almost infinitely worse than Pinball Illusisions. Suspicious. I tried it on our A500. But it didn't work. Astoundingly, Pinball Mania IS A1200-only. What is this? A new game from 21st Century? My, whatever can it be? 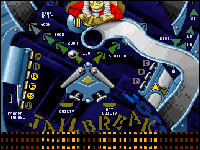 Lawks a mussy, what a surprise, it is a new pinball bash and it is free with the new Amiga 1200, hurrah! Pinball eh? At the end of the day it is just a load of old balls isn't it? And bumpers. And lights and flippers and ramps and noises and bonuses and pure, unadulterated, adrenalin-pumping fun-filled chaos. Isn't it? Well that is what it is supposed to be, at any rate. Unfortunately, the best laid plans often do not come to fruition. 21st Century are old hands at the pinball game game, having churned out tons of them in the past. In fact you can almost imagine what it is like at one of 21st Century's software development meetings. "So what sort of game shall we start working on next then guys? Any suggestions?" "Hey boss, I have got a great idea, how is about creating a pinball game"
"Wow, that is a great idea, let us get cracking and do it". We may mock, but on the other hand computer pinball, if done properly, is great and 21st Century has certainly proved itself adept at the art, producing several extremely enjoyable ones in the past few years. 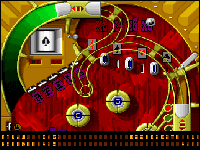 Pinball Illusions, released at the beginning of this year, is a prime example of this, being a game which is adored by all and sundry here at CU Amiga Mag. But enough of the history lesson, "what about the game in hand", I hear you scream? "Surely they cannot continue to flog the same old dead horse without the whip breaking?". Okay, okay, I am getting there. First up, a run down of what 21st Century have got on offer for us this time. The first table is dubbed Tarantula and, funnily enough, has a subtle but undeniably distinct arachnid theme to it (there is a humungous great spider from hell plonked right in the middle of the table, for starters). The web related activities of this domain include, just to offer a few examples, a Multibonus where you have to light up the WEB letters to notch up a welcome 20,000 points. Follow this up with a ball shot through the flashing WEB letters and you pick up a huge X2 bonus and one million luverly points. Drop down the Scare rail or the Poison slot to pick up assorted points galore and if you finally manage to spell out TARANTULA (no mean feat these babies are hard to reach) you notch up an earth-shattering 50,000,000 points. And so it goes on with more and more targets to aim for to open up further point-scoring opportunities to push that total of yours into the multi multi-million bracket. The main attraction to head for, of course, is the multi-ball mode achieved by shooting the ball out of the FANG platform through the FANG escape (a task which is as hard as a very hard thing indeed). Not only is this an irritatingly difficult aim to achieve, but you only get a two-ball multi-ball which is a real let down. Surely the normal three-ball multi-ball would not have completely broken the memory banks? If you are a bit of an arachnaphone, you can always go for a bit of correctional therapy in Jailbreak. Here a stern looking judge sits in judgement on your activities, while your balling antics can achieve the release or jailing of a suspect, start a riot or sentence a person to something particularly unpleasant. This table has got the unusual feature of a pair of flippers right in the middle which lets you aim for all those elusive bonus (not necessarily with any success, I might add). For the footie fans there is a soccer themed table with football-associated bonuses such as fouls, goals, kick-offs, penalty shoot-outs and trophy targets to aim the ball for. My personal favourite was the Jackpot table which is more inventively designed and features coolish bonuses like the Hi/Lo Roulette and Craps shots to go for, which were at least vaguely interactive if a little short-lived (after winning at Hi/Lo I would have preferred to carry on until I lost, for example). I have deliberately left any personal opinions of the game until fairly near the end because, quite frankly, they are not particularly favourable. It is not that Pinball Mania is a particularly bad game or anything, but then neither is it particularly good - it falls slap bang into the realm of average. From a company that has so much experience in this genre, I really would have expected much better than what they have gone and put on offer here. My main quibble is with the bottom flippers, talk about limp; most of the time they have about much life in them as a fart in a bottle, pathetically nudging the ball barely centimetres up the screen. Consequently, it is very difficult to get near the top end of the table where all the action is! To make matters worse, in my view, they are completely erratic - I believe in testing games thoroughly so I spent hours teeing the ball off from the exact same spot at the same angle on the flippers and the response was widely different nearly every time I tried it. Most times, as already mentioned, it was hardly worth the effort, but occasionally it would just shoot off at high speed for no particular reason that I could make out. Some tables were better than others (I actually quite enjoyed the Jackpot table) but all were afflicted with the same maladies, as in lack of features and a rather flat, unrealistic feel to the gameplay. The music accompanying the whole experience is good but, unfortunately, the expected sound effects on bumpers and flippers are sadly absent. As I have said, Pinball Mania is not bad and the disk-swapping ration was perfectly acceptable, but I did come away feeling it was a bit of a let down, especially from a company with so much experience in this field. An average pinball sim that lacks features.